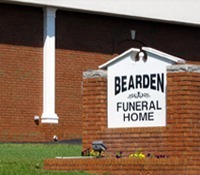 View obituaries of current and past services provided by Bearden Funeral Home. While you are there you may choose to leave a condolence message to show your love and concern. "A Tradition In Community Service"
We live in a diverse society where no two people are the same. We each have our own ideas and personality and our needs are all different. Providing meaningful services for a loved one is much the same. The loss of someone we love is one of the most difficult and emotional experiences we will ever encounter. We take pride in being able to offer services as unique and personal as each individual. With a staff with over a hundred years of experience and a boundless variety of options we can help you arrange a service as unique as the person whose life we are celebrating. We are family owned and operated and whether it is services with traditional burial or cremation, you will be treated with the highest standards of professionalism and compassion. Although, we constantly try to find ways to reduce the funeral costs to families, we do not sacrifice the quality of our service or compromise the professionalism of our staff. We pride ourselves in being big enough to serve you but small enough to care.